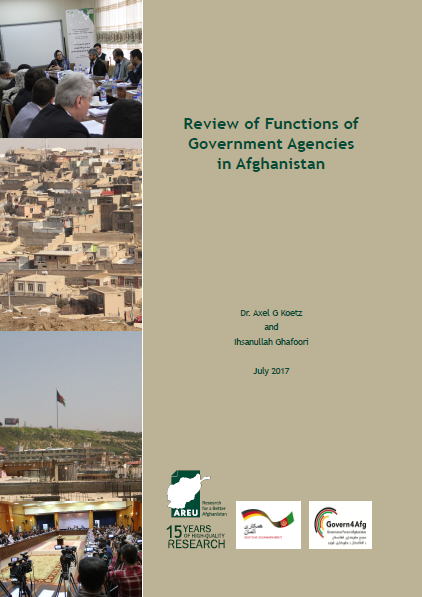 The Government of Afghanistan is characterised by its extensive horizontal and vertical admi nistrative structures, which have grown over the time, following various political principles dating back to at least the 1950s and 1960s, with extremely varying ideologies and behaviours. All the eras—from the Shah overthrowing presidential governments to the Russian occupation to the Taliban rule to various post-Taliban governments—reflect existing and confli c ting structural elements of ad mi nistration. This overlapping of different administrative cultures led to systemic inefficiencies and problems in administrative management. In addition, there are organisational and legal shortcomings. For example, no legally defined tasks of ministries currently exist. Problems, strengths and weaknesses of the ministries are heterogeneous. Functional reviews create transparency and accountability in big organisations, implementing their mandates in proper structures and without waste of resources, all with the goal of serving citizens and businesses in the most effective and efficient way.